The Battery Warehouse Ltd is Lincolnshire & East Yorkshire's premier supplier of batteries & charging appliances. Batteries are made up of 2V cells to produce 6V and 12V batteries. Each cell, in a charged state, is made up of electrodes of Lead (Pb) and Lead Dioxide (PbO2) in and electrolyte of Sulphuric Acid (H2SO4). In a discharged state, both electrodes turn into Lead Sulfate and the electrolyte becomes primarily water. This process is completely reversible when the battery is recharged. These batteries are often called sealed lead-acid batteries, but this term is misleading. A sealed battery would be a safety hazard due to overpressure risks when overcharged and there is always a safety valve present, hence the name valve-regulated. Sealed is opposed to vented (also called flooded). Because VRLA batteries use much less electrolyte (battery acid) than traditional lead-acid batteries, they are also occasionally referred to as an "acid-starved" design. The name "valve regulated" does not wholly describe the technology; these are really "recombinant" batteries, which means that the oxygen evolved at the positive plates will largely recombine with the hydrogen ready to evolve on the negative plates, creating water--thus preventing water loss. The valve is strictly a safety feature in case the rate of hydrogen evolution becomes dangerously high. One result of this design is a much higher ratio of power to weight than large, flooded type battery systems; another is a high-rate power capacity, though of relatively short duration. 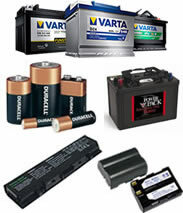 As a result, VRLA batteries are frequently employed in UPS or other high-rate applications. Lead acid batteries designed for starting engines are not designed for deep discharge. They have a large number of thin plates designed for maximum surface area, and therefore maximum current output, but which can easily be damaged by deep discharge. Repeated deep discharges will result in capacity loss and ultimately in premature failure, as the plates disintegrate due to mechanical stresses that arise from cycling. A common misconception is that starting batteries should always be kept on float charge. In reality, this practice will encourage corrosion in the electrodes and result in premature failure. Starting batteries should be kept open circuit but charged regularly to prevent sulfation. Specially designed deep-cycle cells are much less susceptible to degradation due to cycling, and are required for applications where the batteries are regularly discharged, such as Photovoltaic systems, electric vehicles and UPS systems. These batteries have thicker plates that can deliver less peak current, but can withstand frequent discharging. Marine/Motorhome batteries, sometimes called "leisure batteries", are something of a compromise between the two, being able to be discharged to a greater degree than automotive batteries, but less so than deep cycle batteries. They're generally much lighter than other types of rechargeable batteries of the same size. The electrodes of a lithium-ion battery are made of lightweight Lithium and Carbon. Lithium is also a highly reactive element, meaning that a lot of energy can be stored in its atomic bonds. This translates into a very high energy density for lithium-ion batteries. Here is a way to get a perspective on the energy density. A typical lithium-ion battery can store 150 watt-hours of electricity in 1 kilogram of battery. A NIMH (nickel-metal hydride) battery pack can store perhaps 100 watt-hours per kilogram, although 60 to 70 watt-hours might be more typical. A lead-acid battery can store only 25 watt-hours per kilogram. Using lead-acid technology, it takes 6 kilograms to store the same amount of energy that a 1 kilogram lithium-ion battery can handle. The final key advantage is Lithium-ion batteries can handle hundreds of charge/discharge cycles. Our brand portfolio is vast and includes the number one consumer's choice Varta batteries, the prestigious brand that has been delivering premium quality and performance since 1885. The Battery Warehouse source the products through strategic manufacturing partners ensuring the highest possible quality and reliability at all times. With such well established brand names such as Lucas, Duracell, Trojan and Optima, the Battery Warehouse is your one stop battery shop for all your requirements.